1. Review the critique. Hopefully you had a chance to read her comments ahead of time. If not, quickly read over what she had to say. This is not the time to defend your work; do that later with your critique group. Instead, take this opportunity to learn. Ask for clarification. Or bounce an idea off her on how to fix something. Agents love it when you take their suggestions seriously. 2. Discuss your work in general. Let the agent know where your work has already appeared. If you’re someone with a track record, let her know. Discuss how this manuscript fits into your work in general. That said, keep it brief unless she is asking you questions. But also be ready with questions for her. Is your work too diverse? Should you specialize? What advice does she have for someone trying to break into x genre? 3. 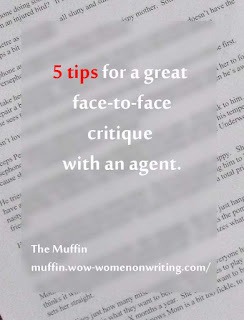 When is an author is ready for an agent? Most of us look for agents because we hate marketing and we want the opportunity to publish at closed houses. That’s a no brainer. But find out what this agent looks for in a “ready writer.” Is it a specific number of sales? Number of polished manuscripts ready to go? 4. What recommendations does she have for new clients? Some agents advise new clients to read certain how-tos or even certain titles in their genre. What does this agent recommend? If you ask her this even though she has no interest in acquiring you as a client, you are showing her that you are ready to learn. 5. What other recommendations does she have for you? This is a catch-all question but what piece of information does she have for you that she hasn’t had a chance to share? It might be something about your manuscript, your body of work, or even the name of a fellow agent that you might consider approaching. A face-to-face critique is a great opportunity to learn, but you can’t learn if you do all of the talking or even most of the talking. Ask open ended questions that can’t be answered with a simple yes or no. Once you get her talking, you have the opportunity to listen and learn. Sue is the instructor for our course, Writing Nonfiction for Children and Young Adults. The next session begins on September 7, 2015.